On behalf of MisterX6 we’re pleased to offer you KLAX. 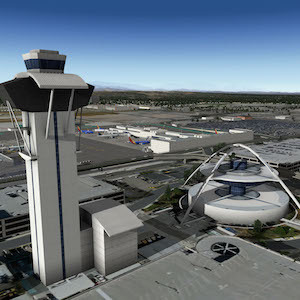 This is a highly detailed scenery of Los Angeles International Airport. I’ve included a small program that allows you to tweak a few options, to increase performance or to remove static aircraft for online flying. You need at least Java 8 to run it. It has only been tested with Windows. You can start it by double clicking the “Configurator.jar” file. Please note that you should not modify any file or folder names for this utility to run properly. If the program doesn’t work for some reason, you can also manually copy the files from the “Configurator” subfolder to turn off runway textures and/or static aircraft.